Welcome, All Things Open 2017 Visitors! Thanks for coming to my speech, "Why Nobody Fills Out My Forms"! Has your web form conversion rate hit a wall? Are users not receiving confirmation e-mails, getting pestered with password or data format warnings *after* they finish entering their information, or bailing after being asked the same questions multiple ways? Find out why not enough people are filling out your web forms, and learn suggestions of A/B tests you can try to help encourage more people to interact. The updated slides can be found here. Thanks for coming to my two speeches! 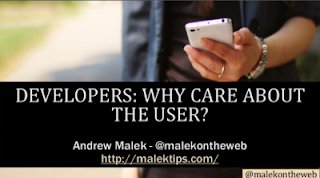 Developers: Why Care About the User? As developers, we deal with technologies, frameworks, and data, making it very easy to forget that what we create is meant for real people to use. While designers and UI specialists should handle most decisions about how a product or service looks and feels, we should all be on the same page to make better solutions. Whether we are building an interface for a desktop website, mobile application, or chatbot, what are some basic design concepts that we as developers can pick up, allowing us to be on the same page with designers and product owners during product meetings and discussions? Thanks for coming to my speech, Icons Behaving Badly! The design behind adding interactivity to an application or website seems trivial; download a free icon collection from sites such as Flaticon, Font Awesome, or iconmonstr, pick an appropriate icon, and add the image to your work. However, should there be more to this process, especially if you are concerned about people understanding how to use what you develop? Learn why the "5-second rule" doesn't apply just to picking food off the floor, how the wrong icon can show cultural insensitivity, why the manner icons are placed in a website or app may be as important as the images themselves, and how to perform icon usability tests. You may be surprised which icons users find to be generally instantly recognizable as to what functions they relate, and which others not so much. The slideshow is now online, and can be found here. 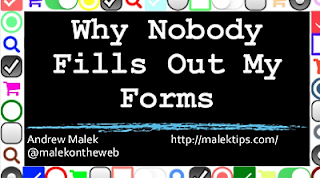 Thanks for coming to my speech "Why Nobody Fills Out My Forms". The updated slideshow can be found here. Click here for the updated slides to the talk "Tablets and Hybrids Need Mobile-Optimized Websites, Too!" 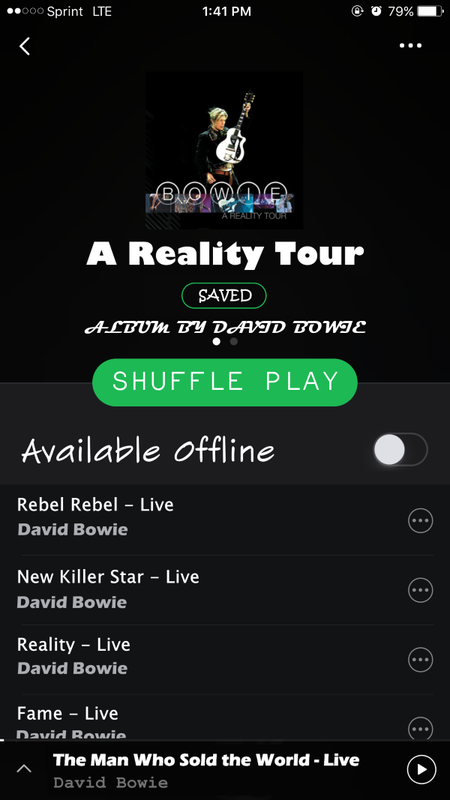 An example of why too many fonts can be confusing - a re-imagined* Spotify on iOS. "A good principle to live by, whether you’re new to typography or a seasoned pro, is to keep it simple. Or to put it another way, don’t use too many fonts. Just as mixing too many colors on your palette will likely result in mud, mixing too many fonts on a page will probably result in a confused message." * - for demonstration purposes only - not the original app's choice of fonts!